THIS IS VERY OBVIOUSLY A WWII GERMAN (DEUTSCH) CHASSIS. ALSO NOTABLE IS THE GERMAN OFFICER IN THE VEHICLE. IT IS NOT A TATRA. 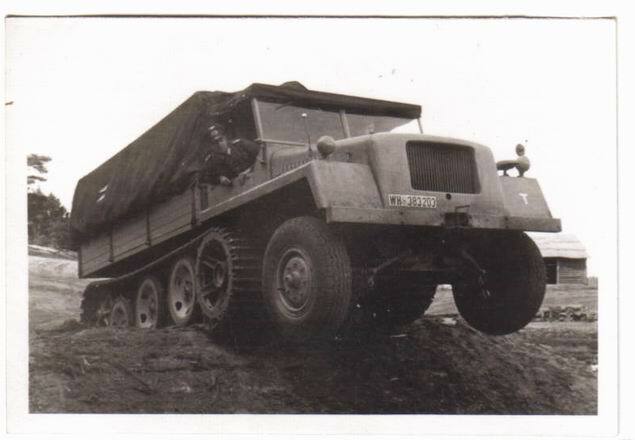 TATRA IS A CZECH COMPANY THAT USED ONLY 8-WHEEL-DRIVE CHASSIS IN THAT ERA AND WERE HEAVILY USED AS TANK DESTROYERS BY THE GERMANS AFTER THE FALL OF CZECHOSLOVAKIA. IT IS ALSO NOT A BUSSING-NAG WHICH WOULD HAVE HAD 2 AXLES AND WAS USED AS A TANK-TRANSPORTER WHICH CARRIED A LIGHT TANK ON THE BED. BASED ON THE NUMBER OF TRACKS IT APPEARS TO BE AN EARLY CHASSIS. THEY GOT BIGGER WITH MORE AXLES AND MORE ROWS OS WHEELS AS THE CONFLICT WENT ON. THIS COULD EASILY BE A PRE-WAR VEHICLE TEST. THIS WAS ALSO USUALLY THE ONLY TIME THE OFFICER WOULD BE POSITIONED LIKE THIS HANGING OUT OF THE VEHICLE ANALYZING THE VEHICLE/CHASSIS PERFORMANCE.